Part A. Present Terrestrial Environments. 1. Geologial and morphologial setting. 2. Climatic mechanisms and climates. 3. 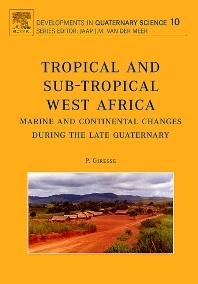 Present vegetation of tropical West Africa. 4. Present fluxes of suspended and dissolved matter in rivers. Part B. Present Oceanic environment. 1. Atlantic ocean circulation - Leakage with climate fluctuations. 2. Suspended matter and particle fluxes in the Eastern Gulf of Guinea. 3. Present oceanic deposition. Part C. 1. Changes deduced from stable oxygen and carbon isotopes and from alkenones in deep sea sediments. 2. Changed deduced from markers of surface ocean productivity. 3. Changes deduced from pollen. 4. Changed deduced from atmospheric dust transport. 5. Changed deduced from deposition processes. Part D. 1. Sea level fluctuation on the Atlantic coast of Africa during the past 125,000. 2. Successive continental shelf sedimentation related to climatic and sea level changes. Part E. Terrestrial evidence of late quaternay changes. 1. Records in lake deposits. 2. Pedological and geomorphological processes and their palaeoenvironmental significance. Part F. Climatic evolution and human presence. 1. Lithic artifact dating and environmental context. 2. Landscape and human development implication. 3. Anthropic action and global change. West Africa and the eastern Atlantic stretching from Mauritania in the north to Namibia in the south offer a large latitudinal stretch incorporating nearly symmetrical climatic gradients from the Equator. On the time scale of Quaternary Glacial and Interglacial cycles, today, we possess well-documented and recently published marine sedimentary records showing changes in oceanic and atmospheric circulations and terrestrial fluxes. Deep-sea sediment records contain a wide range of palaeoenvironmental indicators like oxygen and carbon isotopes, alkenones, foraminiferal and other planktonic assemblages over time periods up to and greater than 125,000 years. These are signals of temperature and circulation shifts and allow Interglacial and Glacial comparisons on a regional and inter-hemispheric scale. However, this effort to synthesize the existing knowledge cannot yet aspire to a global modelling. Linking with terrestrial records, albeit spatially patchy and generally lacking a firm chronology, this book points to shorter time scale chronologies from lakes, marshes and river deposits. Diverse and not very wellknown literature, both French and English, is reported here. Lastly, the book records recent knowledge of the first steps of human occupation of frequently hostile environments and considers the environmental impact of ancient and modern societies.